The road to high readiness is paved with exercises intended to prepare a brigade and its supporting units and tactical aviation to conduct full spectrum warfare. Until 2014, those exercises had a specific focus – the mission in Afghanistan. Training scenarios often covered the full range of possible missions – humanitarian assistance, peace support, combat – but the nuances and complexities of counter-insurgency dominated the certification component. 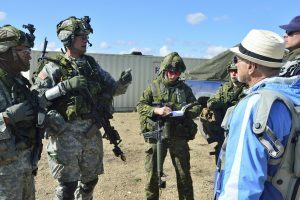 Collective training may have returned to the broader focus of a war rather than the war, but soldiers of 2 Canadian Mechanized Brigade Group (CMBG) felt the distinct influence of Russian operations during their Road to High Readiness (RHR) preparation to become the Army’s standby force for worldwide deployment. 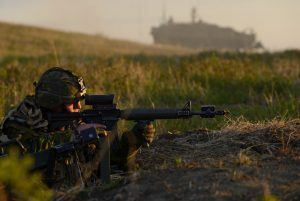 In June, the Army stood up a Canadian-led multinational battlegroup in Latvia comprised primarily of soldiers from 1 CMBG, based in Edmonton. The Army also has a training mission in Ukraine and recently concluded a land task force in Poland. 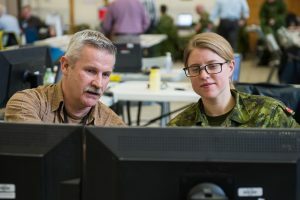 So an Eastern European flavour to two key certification exercises, Unified Resolve in February and Maple Resolve in May, was probably expected by Petawawa-based 2 CMGB, the next in line for deployment. Still, both exercises pushed the brigade with a range of cyber attacks, phishing expeditions and social media disinformation campaigns as it conducted combat operations against a formidable enemy. Unified Resolve is the Army’s premier formation-level exercise and its largest computer-simulation training event, and served as the certification for 2 CMBG’s headquarters staff and artillery and engineering regiments and service battalion. 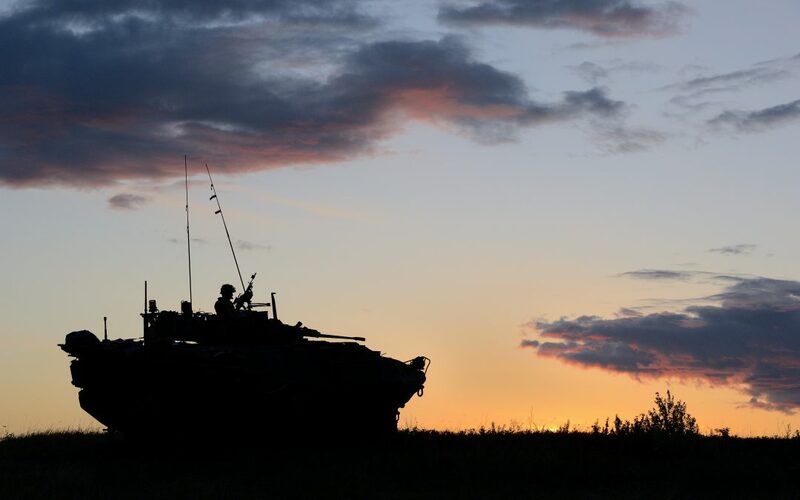 Maple Resolve, the culminating test on the RHR, confirmed the brigade’s three infantry battalions and armoured unit, as well as its supporting tactical aviation. While the primary objective of the RHR is to ensure the brigade, from its headquarters to the individual soldier, is combat effective, the training missions of Iraq and the Ukraine, and the possible peace support operation in Africa demand a more varied skill set. Engaging with local populations and civic leaders, countering criminal activity and insurgency, or assisting during humanitarian crisis and natural disasters require a wide array of role players, real and simulated, in each exercise to deliver a realistic training experience. Preparing for Latvia, though, has required more emphasis on cyber and social media. Countering electronic intrusions into the network and responding to activity on Fakebook, a Facebook-like social media channel, were almost as time consuming for commanders as manoeuvre operations. Both Unified and Maple Resolve were set in the Caucuses, in the fictional countries of Atropia and Ariana. In the scenario, 2 CMBG entered a conflict on the side of Atropia, a Canadian ally since the 1990s, after long-simmering tensions between the two neighbours, in part over oil and hydrocarbon resources in the Caspian Sea, erupted into war when Ariana began a military campaign across their shared border to “liberate” Atropian citizens with ethnic ties to Ariana. The conflict included disruptions of Atropian public and private computer systems; the emergence of an insurgency called the South Atropian Peoples’ Army that began attacking Canadian logistics convoys and lines of supply as it sought an independent state straddling the border of southern Atropia and northern Ariana; a crime family that took advantage of the chaos to further its goals; and over 15,000 refugees. 2 CMBG, known as Task Force Tomahawk, and flanked by simulated brigades from the United Kingdom and the United States, fought to clear an opposing force armed with T-90 tanks, BMP 3 infantry fighting vehicles, multiple rocket launcher systems, ISTAR assets, and substantial cyber capabilities. While the combat operations required much of the brigade’s focus and strength, many of the injects and what LCol James L’Heureux, the exercise director, called day to day frictions, drew on its other assets. In one, a crime family acquired and used a chemical agent similar to mustard gas on part of a convoy, forcing the battlegroup commander, at the time focused on preparing to cross a river and destroy enemy targets, to also manage and decontaminate critical pieces in his rear element needed for the attack. In another, the brigade was required to resolve a possible conflict with a religious leader when an imam leading over 10,000 followers planned a pilgrimage through the brigade’s manoeuvre space. Under the Army’s new doctrine on religious leader engagement, a chaplain was deployed to find a solution. Other injects included responses to human trafficking and child soldiers, in line with newly developed Canadian Armed Forces doctrine, and a mass casualty incident following the downing of a CH-147F Chinook helicopter that required the immediate response of a lot of resources. Fakebook, though, presented a new twist. Each battlegroup had its own page and soldiers were able to post imagery and text to try to influence local populations by countering enemy activity such as taunting videos or disinformation. The threat of phishing expeditions was also prevalent throughout both exercises. In one inject during Unified Resolve, an email with a subject line about a military pay raise caused many in the headquarters to click a link – some even forwarded it to family members. Training experiences like that pay off on operations, said Major Spencer Sharpe, deputy commander of the recently concluded Land Task Force in Poland. The ubiquity of unmanned aircraft near the borders with Kaliningrad and Belarus required the task force to adapt to the reality of “being filmed every day” by adopting low level mitigating tactics such as better camouflage. Likewise, persistent text messages on personal phones requesting documents or providing links necessitated good cyber hygiene. Private Leah Lauersen of the 21 Electronic Warfare Regiment works alongside David Preeper during Exercise UNIFIED RESOLVE on 31 January 2017. The conflicts of the Cold War are foreign to many serving members of the Army. Consequently, much of the institutional memory for how to conduct operations against a near-peer in a NATO context resides with the experts at CASC, a team heavily comprised of Calian Training contractors like Gauvin, a retired artillery officer with 38 years of experience, including four with NATO’s Allied Rapid Reaction Corp. Thank you for your service! Well done!